Tough Double-Action Professional Trigger Spray Bottles. Kwazar Mercury Pro+ Spray Bottles are professional grade, adjustable, double-action sprayers suitable for any detailing job and may just be the best sprayers you will ever use! Their unique double-action trigger sprayers deliver twice the output per stroke, saving time and effort every time! 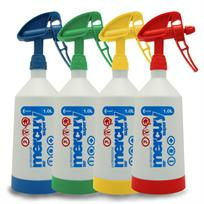 Kwazar Mercury Pro+ Spray Bottles are made from highly durable materials complete with Viton seals for superior chemical resistance. Each translucent bottle has an embossed scale for easy measuring and includes an integrated fluid filter.